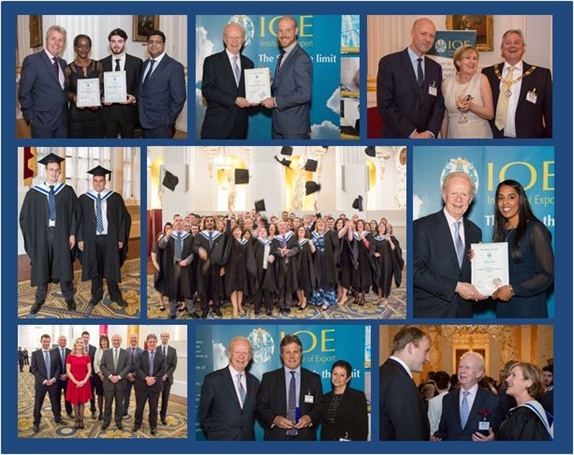 Graduates are invited to our prestigious Prize Giving and Graduation ceremony where they are formally awarded their certificate and Graduate Membership of the Institute. The event is held at the Lord Mayor of London's residence, Mansion House, London. The perfect setting for this important event, located opposite the Bank of England the town Palace was built during the reign of George II, its grandeur was designed to reflect the City of London's position as one of the world's leading financial and trading centres. The Institute of Export & International Trade holds this prestigious event in order to show our appreciation of the dedication and commitment our students have put into their studies and to give them an opportunity to meet with fellow students, employers and dignitaries involved in international trade. Most of our students are in work whilst studying with us, which makes their achievements all the more impressive. Many of them are starting out on their career paths with large companies. We attract around 200 people and the Institute invites major stakeholders from the world of international trade, such as Department for International Trade and UKEF. Our graduation ceremony is a major highlight of the year and the perfect opportunity for students to celebrate their hard work and academic achievementswith their family and friends. The ceremony will begin at 17:00, followed by a full reception from around 18:30. The evening will draw to a close by 21:00. IOE&IT students who are graduating in 2019 will receive a ticket for themselves free of charge. Additional guest tickets can be purchased using the link below. You can purchase as many tickets as you like as long as there is availability. Each year we award prizes to the students who have gained the highest mark in a module or overall. The prizes are sponsored by a range of companies, offering the opportunity to promote your brand to an audience of newly qualified international trade professionals.